Why there is still no full-fledged Internet of Value? Despite the emergence of new technologies (both information — data transfer — and financial — blockchain and cryptocurrencies), the world of modern finance is still characterized by isolated networks for creating, storing, transmitting and exchanging values. But why, having entered the era of fast, easy, effective and cheap information exchange (the internet), have we still not entered the era of the Internet of Value? What’s the problem, and is there any new technology that could contribute to its solution? Over the past two decades, we have witnessed the explosive development of information processing and transmission technologies that have revolutionized many aspects of human life, including the economy, as well as our daily lives. At the same time, however, technology for transferring value remains to a large extent at the level it was in the middle of the last century. This technological and social skewness cannot stay forever. Following the Internet of Information, the Internet of Money must come true. Or in a broader sense, the Internet of Value, where the transfer of value will occur as quickly, easily and cheaply as the transfer of information occurs today. In addition, the entire global economy as a whole, and each of its participants, in particular, will be able to feel the results of the network effect in this sphere. But what still stands in the way of this undoubtedly revolutionary innovation? After all, it would seem that there are no limitations to it: a high level of development and penetration of information, network, and mobile technologies; the fact that most of the money supply is already digitized (non-cash money); the globalization of the world’s economy — all of this would automatically lead to the emergence of the Internet of Value. However, we still see only its most timid rudiments. Of course, these problems are primarily organizational and ideological in nature: financial market players are not in a hurry to overcome inertia, to change established methods of doing business and work patterns and so forth. However, another compelling reason why the Internet of Value ​​still remains just a concept is that to date there has been no technology that would allow this to be put into practice. Even the emergence and further development of innovations like blockchain and cryptocurrencies, which were created with the hope of sorting out precisely this issue, have yet to yield the anticipated results in this respect. The reasons why this has not happened are on account of the following: blockchains are just another alternative implementation of a value and/or asset registry, which, like other registries (for instance a bank registry, or of an exchange or payment system) is poorly or not connected at all with other value registries. Of course, blockchain and cryptocurrencies perfectly solve the problem of trust in a payment system. Thanks to the use of blockchain, payment systems and other value and asset registries build on this technology can get rid of the necessity to have an intermediary or an arbitrator that other participants have to trust, making such systems trustless. But this does not solve the problem of interaction and integration of these systems with other systems, even with those build on similar tech. In this sense, blockchain-based ecosystems are not much different from traditional payment ecosystems. Even the most popular blockchains are completely incompatible with each other by default. In addition, most of them have scalability problems, i.e. 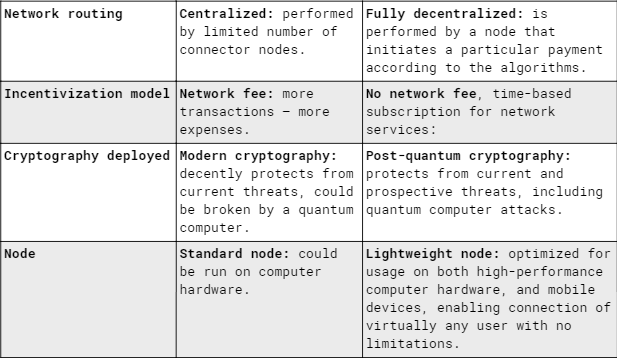 natural technological limitations on transaction speed and cost. And despite active development of Layer 2 solutions that are designed to overcome these restrictions, these solutions still do not solve the problem of interoperability even within the cryptocurrency market, not to mention the integration of this market with the world of traditional finance. Today the existing local networks of value are isolated with little or no interoperability. Thus, today we have many heterogeneous ecosystems (local networks of value transfer and exchange), which do not (or at least insufficiently) interact with each other. It is almost like if, instead of the global internet (the network of networks), we had only a bunch of unconnected or loosely coupled LANs (local area networks of information transfer and exchange). We now have exactly the same situation in the sphere of finance without the Internet of Value: we have many individual banks, we have payment systems, we have stock exchanges (both traditional and crypto), we have e-wallet providers, etc. We even have several blockchain-based cryptocurrencies, and other value registries. In other words, we have a lot of local networks for value transfer. But they are all poorly connected or weakly interact with each other. In the world of siloed networks, competitive spirit oftentimes outweighs cooperation incentives. However, the success of any given network soon reaches its limit, unless the network learns how to benefit from integration within the global ecosystem. So how can we solve the problem of creating a global network for value transfer and exchange? Different value transfer networks need a universal solution that provides a technological opportunity to interoperate, to lower the costs and to accommodate the growing number of transactions with no speed or safety sacrifices. Such a solution should be open-source, support multi-equivalence, be lightweight, have high productivity and throughput, i.e. it should become, in fact, a network transport protocol for the Internet of Value. 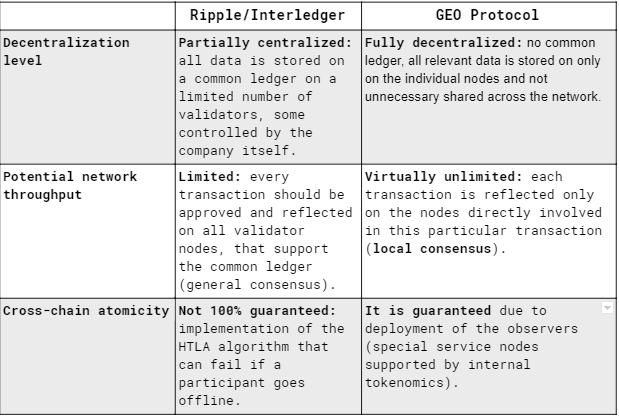 As we can see, GEO Protocol has a number of advantages, that could add up for a better network effect. All that makes GEO potentially a very promising candidate for the role of a universal protocol for the future Internet of Value. Why there is still no full-fledged Internet of Value? was originally published in Hacker Noon on Medium, where people are continuing the conversation by highlighting and responding to this story.